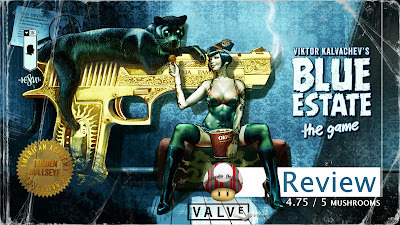 Super Duper Gamer Team Entertainment: Blue Estate... reviewed! This is what happens when Comic Awesomeness & Comedy collide with an on-rails shooter… chock full of creativity and naughtiness. “Viktor Kalvachev’s Blue Estate the game”… is based on a comic by… Viktor Kalvachev & Kosta Yanev. Don’t know who they are? …It’s quite alright, we don’t either, but we hope to see more from team Hesaw because varying styles change up the pace. Following trends is not the way to go, taking your own route and owning the fluff out of it… gives gamers more options to enjoy, and this is what I see in this game. This isn't a game for everyone (I just want to make that clear)… especially the kids below the recommended age, so put them to bed and game it up. If you like action… want a sense of getting back to the arcade or want to know what it feels like in a sense, then you’re not that far off when you get together with a some of the craziest friends you have playing this on a big screen w/ the surround sound cranked just below… the volume of disturbing the peace! The story feels good… the art is great, and it feels like one of those comic style movies that places a (light) gun in your hands as you ride shotgun with a fun motor-mouth narrator sitting in the back seat. Light gun games don’t come around that often, and even with FPS games giving you a similar feel mainly do to the first person view (some almost following a similar blue print in their story modes because they take you by the hand even when they shouldn't because its not on-rails BUT)… light gun games have their own charm when it’s done right. Accuracy and timing pays off as you progress in this game that starts off with you rescuing a stripper/love interest from the dangerous clutches of… someone that’s quite the “little” character and then some (so expect a good mash up in this story). Hesaw definitely sends you walking into an inferno... that maintains its action quite well. The game is priced very well… they didn't play around with a ridiculous price tag which gets a thumbs up from us (two thumbs up). The game is available for PS4, Xbox One, PC, as well as Leap Motion… for fans of the controller. Cons of this game (for me) are… “Why in the world isn't it also on the Wii U?” The Wiimote naturally doubles as a light gun (more on the lines of something you’d see in Star Trek via the phasers… but a light gun none-the-less), so we’d definitely like to know why. The experience would be a lot more at home on the Wii U because of the Wiimote more so than… the Xbox One, and the PS4. The nunchuk would drive home the experience also… because you’re required to do certain movements to overcome various obstacles while still taking on the enemy. It’s a nice move that a lot of other ORS’s don't consider, so you're able to do more than just... point and shoot without it becoming a pain since opening doors and stuff help you move forward. Another con that stems from the lack of a Wii U version (for me), is when I used the standard controller on the PC… it was a pain because the movement of the camera could’ve still been moved around like that of a traditional FPS game to improve on aiming in this fast paced game. It doesn’t break the game… and I was able to proceed, but… I really (really) got into the zone when I put the controller to the side and got on the keyboard & mouse (while thinking of how awesome it would be to play in a more traditional way on the Wii U because of the Wiimote & Nunchuk... without buying an additional peripheral that would only be used based on the frequency of genre related purchases). How did Team Hesaw and Viktor Kalvachev meet? VK: I am one of the founders of the company and had the pleasure to welcome everyone on board myself. What made you consider doing a game based on the Blue Estate comic? VK: It was one of my partners who kept pushing to make the comic into a rail shooter and I finally gave up. After a month of brainstorming how to approach it I was pretty happy with the chosen direction and we decided to apply for funding through CNC (a French government organization helping studios in France finance their projects). Luckily we were given the grants and so it began. It was so much fun to transfer the comic book universe into a playable one. Why did you decide to go with an on-rails shooter instead of another genre? VK: We love the genre and we miss the good old games like House of the Dead and Time Crisis. Rail shooters are also a lot cheaper to make then FPS games and we used the controlled camera to give the game a more cinematic feel. Any reason why the game isn’t on the Nintendo Wii U? For use with the Wiimotes? Samuel Jacques : Actually, we are using a Unreal 3.0 for the game engine. To release the game on WiiU, we should undertake a massive technical work that is simply beyond our capacity. I wish we could do a WiiU version as I really love the console. Do you see yourself making more Blue Estate games based on the positive response from gamers? VK: We would love to. Only time will tell if will get the chance to make another one or not. Overall, Hesaw made a good move with the game, by placing it in a genre that's not used too often... the story is fun, plenty of action, and the price... forgeeet about it. Its unfortunate that resources stand in the way of this game being on the Wii U... but who knows what a kickstarter could do if they're willing to try.